I absolutely love this minestrone. I found it in a cookbook my mom gave me entitled "Pasta & Italian". Now, in the past I've always thought of minestrone as being a pasta based soup, but this particular recipe called for potatoes (my favorite, yay!). Being the geek I am, I actually looked up the history of minestrone to see if my version is "authentic". Meaning "the big soup", minestrone is actually the name for a variety of soups and doesn't have a set recipe that's always used. Seasonal ingredients as well as little bits of this and that leftover from other meals were thrown together in a pot and voila!...minestrone. Most commonly pasta or rice are used, but potatoes snuck in there eventually, too. No matter how you make it, it's bright, fresh, hearty and delicious. Mangia! Heat the olive oil in a large saucepan. Add the pancetta, onions and garlic and saute for about five minutes or until the onions are soft, stirring often. Add the potato, carrot, leek, cabbage and celery to the pan and cook for two more minutes, stirring frequently. Add the tomatoes, navy beans, chicken stock and bouquet garni to the pan, stirring to mix. Cover and simmer for 15-20 minutes. Season with salt and pepper to taste and serve with fresh parmesan cheese. 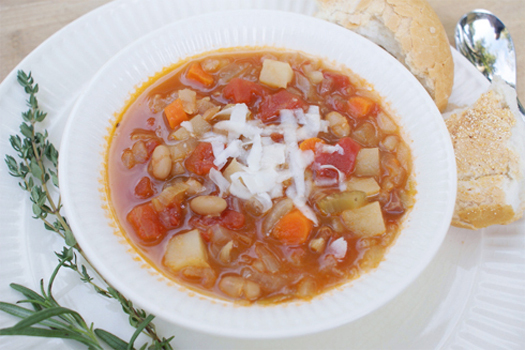 Minestrone is a versatile and comforting soup. Perfect for Fall or anytime of year. Keep the soup recipes coming....Love it. Yummo...love this soup recipe...but I will have my Minestrone the way our favorite Italian (your god mother) taught me....with pasta!